Dayton, July 17 2018 - This weekend was one with celebration but also several disappointments. Dayton Dutch Lions FC (8-3-3, 27 points) had a historic year clinching the Great Lakes Conference Championship with a 4-0 win on Friday. Besides the Women’s team winning a Conference Championship twice this is the the first Championship for the Men’s team since the initial season in 2010. Another remarkable accomplishment was the 6-0-1 record in away games. On Friday the team of Head Coach Dan Griest will play in the first round of the National play-offs facing n2 of the Heartland Division, Chicago FC United (7-5-2, 23 points) in Des Moines. Cincinnati Dutch Lions FC (6-4-4, 22 points) had a great streak towards the end of the season (with a 6-1-1 record in 8 games) but finished third in the Conference. A win vs Dayton on Friday would have even put them in first place, but after the 4-0 loss and Dayton’s 3-0 loss on Sunday vs Lansing United (7-2-5, 26 points), the Lions had to play Michigan Bucks on Monday for third place. After a 3-0 lead the Bucks managed to score three goals in the last 10 minutes to make it 3-3, but the tie was enough to keep the Bucks behind them. 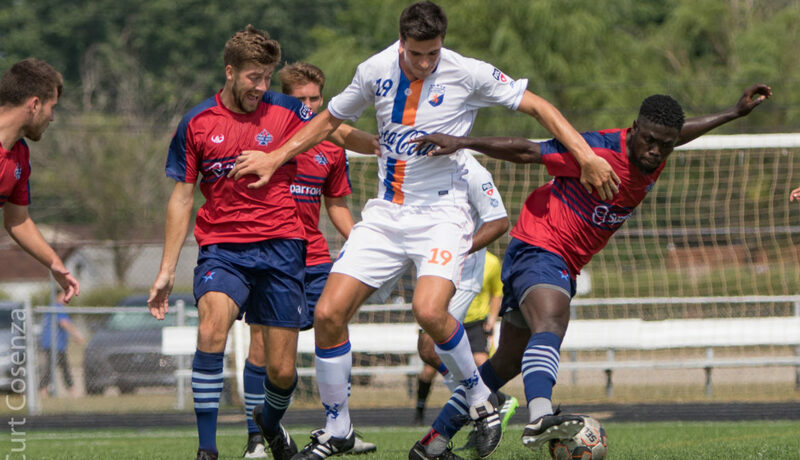 Max Wilschrey scored two goals which brings his season total to 9 goals.Dutch Lions FC NPSL (9-4-0) played a thrilling Conference play-off final on Saturday in Laredo vs the Heat (13-0-0). The Lions played an excellent first half scoring “only” two goals to give them a well deserved 2-0 lead. In the second half the Heat came back to tie the game 2-2 forcing the Lions to go to overtime for the third time in a week. After 30 minutes of overtime the Lions came up just short 4-3 in a great contest. Still a great season for the team of Head Coach Marco Pruis but although the disappointment was huge after being so close to the 2nd Conference Championship in three years. Florida Gulf Coast Dutch Lions FC (5-2-1) also suffered a heartbreaking loss in the WPSL Regional Final in Chattanooga vs Pensacola SC. After a red card in the 60th minute for a hand ball in the box the game seemed to go into overtime with 0-0, but Pensacola scored in the 92nd and 94th minute sending the Lady Lions home empty handed. Coaches Vincent de Weger and Davy Hendriks can look back on a great season though with the Conference Championship and being so close to the Final Four in only their second season. FC Cincinnati (11-3-5, 38 points) held on to their first place in the USL PRO Eastern Conference standings after a convincing 2-0 win vs Tampa Bay Rowdies (6-8-4, 22 points) in front of 25.416 fans at Nippert Stadium. They play again on Wednesday vs Charlotte Independence (7-6-6, 27 points).